Medical emergency bracelets join the digital age with EPIC-id. A flash drive cleverly integrated into the design holds health and identifying information. Fill in as much or as little as you prefer on the available templates—allergies, prescriptions, medical conditions, and even religious or treatment preferences. Today, many first responders have computers on board. In just a few seconds, they can access your info. No special software is needed. 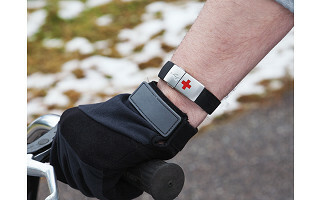 The well-known red cross symbol lets others know that EPIC-id is a medical bracelet. Also, a universal USB sign indicates that critical information is a plug in away. Avid cyclist Lee Gilbert created EPIC-id, knowing that athletes often are out on the road alone. She wants everyone—from children to able-bodied people to those with health conditions—to be prepared in case of an emergency. Made of hypoallergenic rubber and stainless steel, the bracelet can easily adjust to any size wrist. Helpful whether you’re close to home or traveling, this simple, seamless design will add some peace of mind to your daily life. Happy launch day! We are very excited to be part of the Grommet's lineup this holiday. We created EPIC-id so that it would be easy for first responders to quickly find your medical information in case of any kind of emergency. We look forward to your questions! How wide is the band? It looks like it might be a bit wide for a woman's wrist. @Jackie The band is just 1/2 inch wide -- I am just 5'2" and have a petite wrist -- it looks great! I'd just like to make a comment from a first responder's point of view. I don't carry my computer with me or anything else that this would connect to at any time. I would really hate to miss an important allergy or medical condition that could very easily be written on that bracelet instead. @Terri First A first responders (a good citizen) should call 911. The professional first responder is the one you want accessing EPIC-id. The EMT may be prevented from using their USB ports for random unidentified flash drives but in the case of EPIC-id the person in distress is directly in the care of the EMT in the ambulance so the risk of the flash containing a malicious virus is virtually nonexistent. I'm also curious about size as this would be an item for my 7 year old son. @Lee I have the opposite question - How big or a wrist will it fit? And don't let the nay-sayers get you down - it is a great idea; I just ordered one. How would you download your information onto it? Is it compatible with Word or Excel or is there special software needed or would I have to take it to my doctor to upload the information? 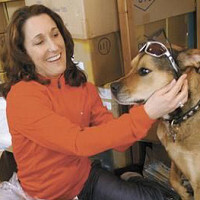 @Aileen Watch the video and it will answer all your questions. @David There is nothing to download. You simply enter in the information into the pre-loaded medical ID forms. Compatible with Mac or PC---Mac OS 10.7 or later Windows XP, 7, 8 or later. What is the metal part of the band made of? I have an allergy to nickel, and I would hate to get a rash while wearing a band to identify my allergies! @Wendie Hi Wendie. The metal part is made of stainless steel. Can this be used outside the USA and air travel? Yes - EPIC-id is a perfect way to keep all of your important medical information with you as you travel. I travel extensively for business and make it a point to keep my contact information up to date -- so when I'm in Munich for the ISPO trade show, I will change my contact information to my colleagues/friends I'm traveling with. I can update my information from the plane with my laptop -- and I don't need a wifi connection. I AM a professional first repsonder and while his seems like a great idea, the old school medic alert bracelet will work better and, in situations where seconds count, faster than this item. If you're having a medical emergency, there's no time to take off your bracelet, find a computer (no, not every policeman, fireman, or paramedic carries a computer with them at all times, in fact, very few do) load your information and THEN treat you. Also, in my department, we can't run any programs from the USB port of our laptops for security reasons (as another poster mentioned). Sorry, this is a perfect example of where technology just isn't as good as the old-fashioned way. Buy a medic alert bracelet and post your medications on the fridge. There are a number of emergency ID options out there -- EPIC-id is a more comprehensive ID way to communicate your needs. The EMT may be prevented from using their USB ports for random unidentified flash drives but in the case of EPIC-id the person in distress is directly in the care of the EMT in the ambulance so the risk of the flash containing a malicious virus is virtually nonexistent. Wow, you regurgitated the same answer you gave to Dr Dave here's the problem, to the computer in the ambulance, police car, squad, truck, etc, your EPIC-id is exactly what you said, a "random unidentified flash drive". What's worse, according to the video, it appears to lunch a program automatically, similar to malicious programs. Also, running back and forth to the ambulance, truck, squad, etc to check to see if your device will work is not an efficient use of time spent working the patient. Many of the MDT/laptops in emergency vehicles are not removable. If anything, it takes responders away from the scene. Thanks for the feedback here. We understand that EPIC-id is only as good as the first responder checking it and the technology they use/have time to use. In many cases, EPIC-id is an already adopted technology, but some folks might still prefer the old style ID bracelets. We at The Grommet try and launch new and unique products, and EPIC-id fits that belief. We think many folks will find a use for this product and believe that as computing and mobile devices becomes more widespread, different industries will continue to adopt the practice of checking these new technologies. In terms of the program it launches, EPIC-id is meant to show the patients emergency information. The program is simply the vehicle for displaying that emergency information. We appreciate your feedback and thank you for being a member of The Grommet community! @Matthew To speak to Peter's concern about automatic launching: Your assumption was incorrect- the on-board computers on the ambulances, police cars, squad, trucks, etc can be set to either automatically launch or to open once the appropriate file is selected--it depends on how the computer preferences are set up. This is a neat idea, however I gotta say that I think someone could easily write / print out a piece of paper and store it on them somehow if they had severe allergies, etc. Seems like a high-tech solution for a low-tech problem. Or I could buy a USB flash drive for little to no money (I was given some by a computer store) and store all this info on a .TXT file for the same purpose -- if I were that worried. I can't foresee a first responder having a laptop w/ them that they would be willing to plug in a device like this in to (some IT depts might even disable external hard drive connections for fear of viruses). I think a better idea would be an engraved pedometer or engraved pedometer/USB drive that has the most important information, but also has additional uses and also more useful. Thanks for the feedback. While many folks might prefer the old style ID bracelets, we at The Grommet try and launch new and unique products. EPIC-id breathes new life and integrates interesting technology into an issue like medical identification. We think many folks will find a use for this product and believe that as computing and mobile devices becomes more widespread, different industries will continue to adopt the practice of checking these new technologies. Unfortunately, as someone in IT, I have to add my voice to those who've expressed concern about this product, especially since it did not provide any alternative way of accessing the data, via a QR code, phone number, RFID, etc. Unfortunately, if this product were pitched on Shark Tank, I think it would go down in flames. It's a shame because my 1st alert bracelet just can't contain all the info that I would like a medical person to have about me. Not to mention family contact info, advanced directives, etc. It's a shame that it couldn't have been more NFC like ApplePay where the data could be securely read. If Apple can roll out secure technology, can't the medical industry? Hi there, all. Grommet CEO here. I appreciate the dialogue here. I am sure Lee will take on board constructive suggestions as she advances and adds to her product down the road. This discussion board has been very valuable to many Grommet Makers in just that way. I do need to point out that Lee has devoted her time, energy, and resources to pursuing this solution to a large problem and we have to respect that she has not done so blindly. It's also true that EPIC-id will be a great solution for some, not all. For those who are adopting Fitbits and other more "stylish" solutions to carrying personal data, the EPIC-id will be a welcome improvement on the style of a Medic Alert bracelet. Far better to get someone wearing SOMETHING than nothing. But that diversity of choice is true of every Grommet. None are universally appealing. EPIC-id may be ahead of the "tech platform reality" of some first responders and their policies. I do appreciate those valid concerns about whether the demands of an urgent non-random patient situation, overrule the understandable prohibition of using random flash drives, as a purely practical matter. I would not want to be a first responder who does not benefit from valuable patient information due to an IT policy. Anyway, thanks for the healthy dialogue. Please keep an update going so that I can eventually purchase this very clever device! In regards to HIPPA: accessing a patients data from an EPIC-id is really no different than accessing data off of an engraved medical alert bracelet--it's just a different medium that can provide more data. Medical emergency bracelets join the digital age with EPIC-id. A flash drive cleverly integrated into the design holds health and identifying information. Fill in as much or as little as you prefer on the available templates—allergies, prescriptions, medical conditions, and even religious or treatment preferences. Today, many first responders have computers on board. In just a few seconds, they can access your info. No special software is needed. 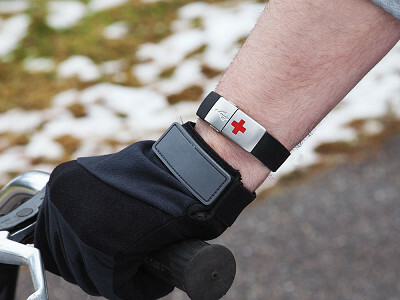 The well-known red cross symbol lets others know that EPIC-id is a medical bracelet. Also, a universal USB sign indicates that critical information is a plug in away. Avid cyclist Lee Gilbert created EPIC-id, knowing that athletes often are out on the road alone. She wants everyone—from children to able-bodied people to those with health conditions—to be prepared in case of an emergency.